The crew at the helm of a passenger ferry were "unaware" it had collided with and seriously damaged a 10m (33ft) motor cruiser, a report has found. The Red Falcon ferry and motor cruiser, Phoenix, collided while heading for Cowes, Isle of Wight, on 29 September. Passengers told the crew they had seen the motor boat with four people onboard pinned against the ferry's bow. The ferry carried on sailing to the island as the master and chief officer "felt sure" it had not hit anything. A Marine Accident Investigation Branch (MAIB) report into the crash found the crew only became aware of it after viewing footage filmed inside the ferry once it had berthed at East Cowes. 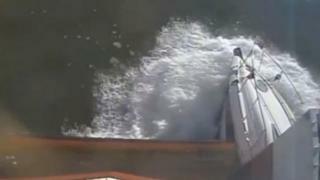 The footage revealed the motor cruiser had been pressed against the ferry's bow for 18 seconds. The report also found the sun's glare would have made Phoenix "very difficult to see" by the ferry's crew. The MAIB report found the motor cruiser's driver did not see the ferry approaching because he was looking ahead. The crew and passengers of several small boats, who had also seen the crash, sailed to the motor cruiser to offer help and alerted the coastguard. The motor cruiser, which had a five metre (16ft) split in its hull, was escorted by lifeboat to Cowes. Insurers later declared it a "constructive total loss". Falcon, which had 182 passengers onboard, was not damaged. No-one was injured on either the ferry or the motor cruiser. After the crash, MAIB said the ferry firm had made a number of recommendations to improve bridge watch keeping procedures.